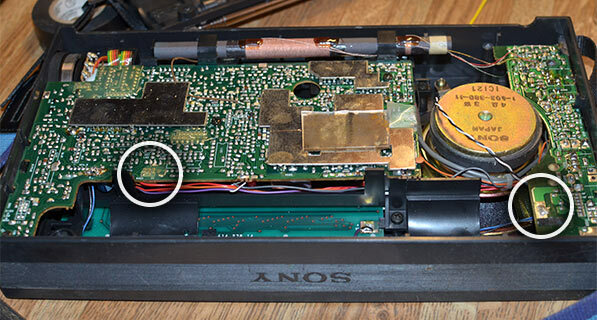 This entry was posted in DIY, Retro, Thrifting and tagged Error, Repair. Bookmark the permalink. ← A New Blog for a New Year! Thk your luck to get this type of radioradio,pls find for me another one. I also fixed those barbed contacts but jumpered both the battery contact and the antenna. I also found I needed to be careful when installing the batteries because the right side would hang up before the battery was fully in. I bought mine new in 1996 for 360$ and have been very pleased. It is a great radio. I have owned this same Sony radio for 15+ yrs, bought mine used at a flea market for 20.00. No other radios I have owned can bring stations in like this one. Bought my ifc2010 when first mfg in 1887, has been excellent. however one problem now exists. When I use my power supply (original) error 3 comes up. operates fine on batteries.